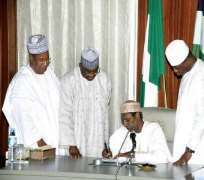 San Francisco Jan 7, (THEWILL) - Some persons in the Presidency forged the signature of President Umaru Yar'Adua on the 2009 Supplementary Budget and the Inspector General of Police must investigate the act, the Conference of Nigerian Political Parties told a BBC Hausa Service on Thursday. CNPP's lawyer, Mr. Femi Falana and National Chairman, Alhaji Balarabe Musa said the Presidency has refused to show proof to back its claim that the ailing President signed the document and urged the IG of Police to bring forgers to justice. Falana particularly warned that the group might seek redress in court if the police boss fails to act. Balarabe Musa said the Vice President, Mr. Goodluck Jonathan should openly explain to Nigerians how the signature came about because Nigerians have lost confidence in the government officials that have so far spoken on the matter. “If the Vice President addressed the country that it was the President who signed the budget we may agree or the President should speak to the nation through the international media, since he was reported to have chatted with some cabinet members,” he said. Responding on the same BBC programme, the Minister of Special Duties Ambassador Ibrahim Kazuare said rather it was those who doubt the President's signature that should show proof of forgery because every top official in government knows the President's signature. THEWILL has been trying to get a hold of the Principal Secretary to the President, Mr. David Edevbie to confirm if he met with the President. Calls and text messages to his phones have not been acknowledged. Mr. Edevbie told a highly knowledgeable source that he was with the President at the hospital in Jeddah when the President appended his signature to the budget and other documents. “Let me tell you something, you know David is very professional and he would not lie to me. He told me he was with the President at the hospital for a while, and the man signed the documents he took to him. That's his Principal Secretary if you know what I mean. Your earlier report that he didn't see him was inaccurate,” the source concluded.